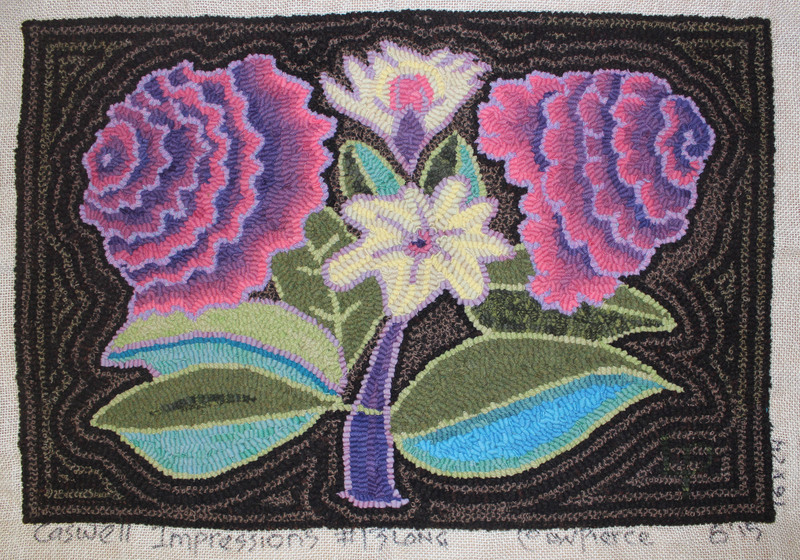 this is the first Caswell Impression square that I hooked… and i was determined to use a recycled brown plaid as the background. but it was funky… didn’t have the body of the beautiful wool… so I decided to ‘run out’ of it… ha! the Dorr Antique Black was a great substitute! Letting the wool at hand guide me; i used a bright swatch i bought from Robin Price several years ago; she was selling off Gloria Grey’s stash. Part of the idea of hooking these Caswell Impressions is to give myself permission to go with the flow; use wool at hand and let it be the guide to the whole colour plan. I know my mother was inspired by her stash… wool and colours giving birth to inspiration. so far it’s a very fun adventure! the lead wool in this one is the outlining; a spot I dyed over yellow textured wool. I love the graphics of these Caswell Squares… and outline and fill emphasizes the graphic quality. Zeurah fills her squares… so many lessons to be learned. I couldn’t see what the bottom motifs were; I thought they might be seed pods. when I looked on the Metropolitan Museum website: http://www.metmuseum.org/art/collection/search/13576 I found out that they were flowers. 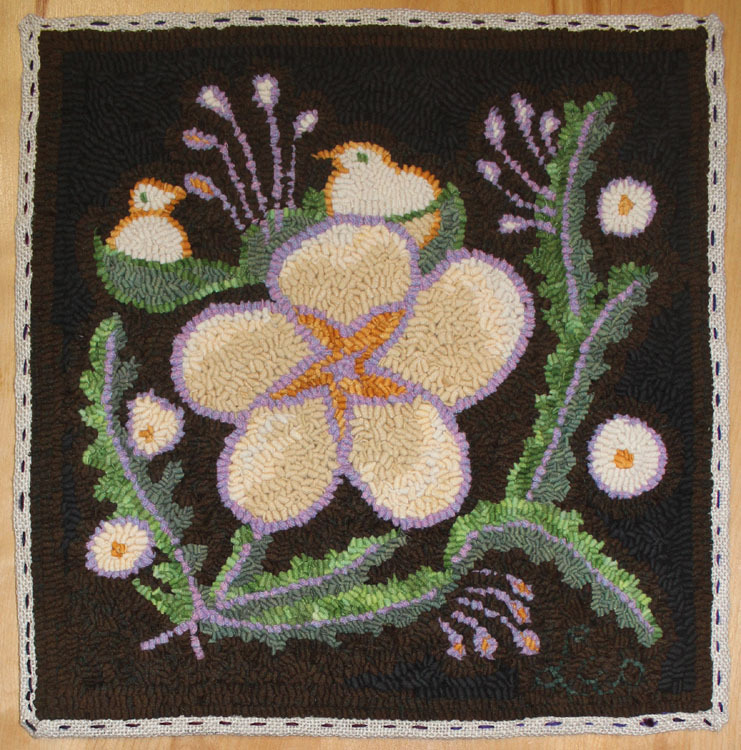 I pulled out what i had hooked in and put in the lovely pink little flowers… more in keeping with the whole square. yes… once you get started, it’s hard to stop. like a good book, 1 chapter after another… ha! I did find it, what a magnificent piece of work! What will you do with your mats? Will you put them together, you’re adaptions are beautiful, as is all of your work! I found the carpet. What a wonderful inspiration for hooking! How did you know about the Caswell carpet? Not recognizing the reference, I thought the designs were based on an actual potato chip which I could not find in the rugs. 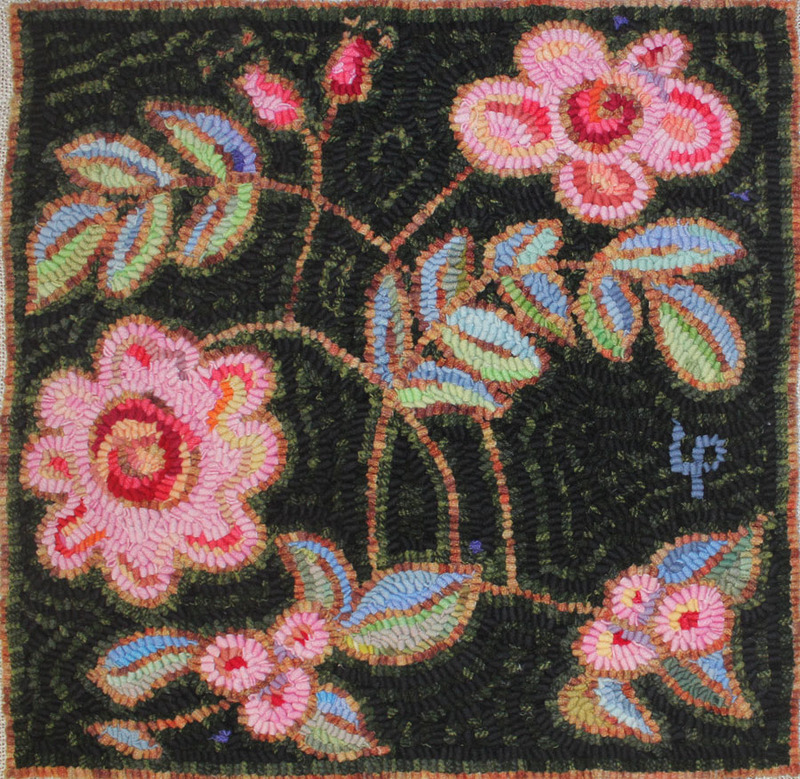 Hi Betsy… the Caswell Carpet is in a book called ‘The Flowering of American Folk Art’. i think that’s when i first saw it… many years ago. i’m having a good time hooking the squares. 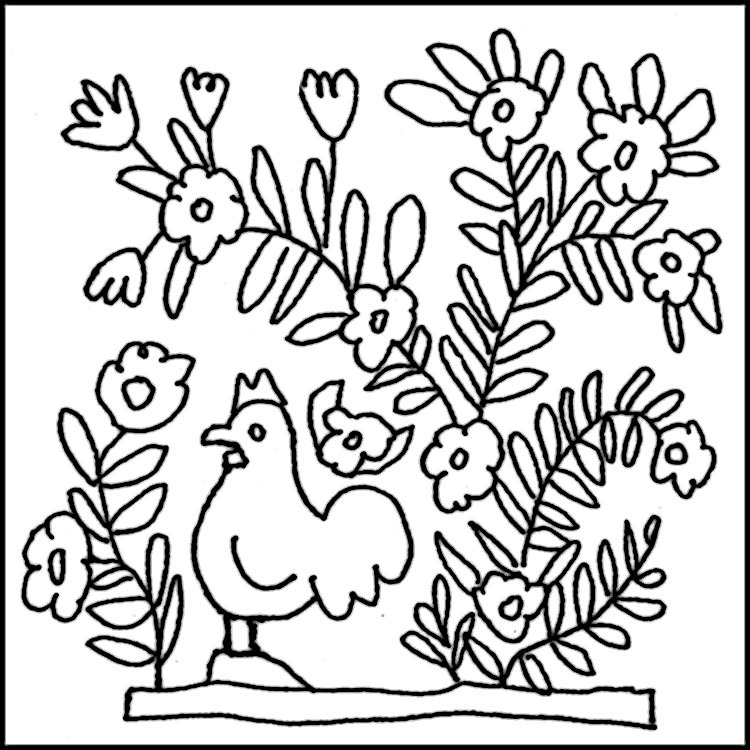 as soon as i get them all drawn into patterns, i will invite friends to help with the project! I did find it, magnificent! What will you do with your prices, put them together? Bare they all the same size? Your adaptions are beautiful! i will not be joining the rugs… though i have created a design with 8 of the squares that would make a great rug. right now i’m just trying to get all of the squares drawn into patterns. eventually, when they’re all hooked, i hope to show them at various venues. There will be quite a few at LRI rug camp… at our rug show! i’m starting to get friends help out in the project… wanna? Hmmmm, how big are they? It’s a bit scary, am I good enough? Do you do the color planning? You must have something in mind for each? i draw the pattern, you pick the colours! Basically, i’m doing outline and fill… picking a fabric i want to work with… then picking colours that go with it. i’m letting the wool lead the way. i’ve been enjoying using the lovely textures for backgrounds and often use a texture or spot for the outlining. then i use noodles to fill in the motifs. trying to be old fashioned and a bit thrifty. so… to answer your other questions… i think you’re good enough, and i don’t have much in mind for each project… except the Blue Jay. you get to interpret the square however you want. You didn’t mention the size, and what are the other patterns? Do you have others already working on them? What about Andra? Might get her going! Is there going to be only one done of each pattern? Laura, everything you do is so lovely!